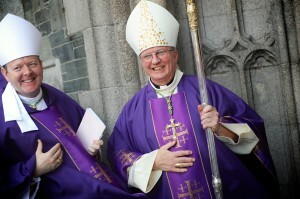 Bishop of Derry, Dr Donal McKeown, and Archbishop of Armagh, Dr Eamon Martin. Pic: Stephen Latimer. The Bishop of Derry has said the Church is called to acknowledge the errors of the past, not to defend them. In his homily for the National Padre Pio Pilgrimage in Knock on Monday, Bishop Donal McKeown warned that it is “idolatrous to worship or to seek to recreate a flawed past”. He said the Church’s job today is not to dream of, or work for, a strong Church in the future. Bishop McKeown said the plank must be removed from our own eyes, and the sin in our own hearts and in the Church must be acknowledged before we dash to criticise the splinter in anybody else’s. He said the first task was to be sure that our parishes and dioceses are “credible witnesses of Jesus” today, people who have known divine forgiveness and who want others to know the joy that it brings. Facing sin and its consequences is possible only for those who have opened themselves up to Christ’s grace through prayer, Dr McKeown told devotees of St Pio gathered in the basilica in Knock. The second task was to speak, like Jesus, the uncomfortable truth in love to our contemporaries. “Acknowledgment of our failings in the past frees us to comment on where our society is also marked by sin,” he suggested. He said believers had to gear themselves up to speak about the awful extent of injustice, self-harm and suicide in our society. The Bishop of Derry highlighted how in Britain, doctors decide whether under 16s should access contraceptives or have an abortion without parental consent while at the same time they argue for banning under 16s from buying caffeinated energy drinks. Criticism, he stressed, should not be directed towards victims but towards the consumerist culture which he said is “killing too many of our young people”. Noting that the ministry of St Pio took place during years scarred by the appalling slaughter of two world wars, Bishop McKeown said the Italian saint proclaimed the love of God as the source of all healing and he bore witness to the Jesus of Calvary for 50 years. “The Church of this century is living with other slaughters – of babies before birth and of too many lives cut short after birth. Jesus tells us that evil cannot be overcome except by speaking the truth and carrying the Cross behind Him. Our society is yearning for authentic ministers of the real God. A self-righteous Church can never do that,” he underlined. Recalling the Taoiseach, Leo Varadkar’s speech in Dublin Castle for Pope Francis’s visit, where the Fine Gael leader said the Church in Ireland has done many good things, Dr McKeown said any denial of that reality is ideologically driven.